Workforce needs tied to geospatial data continue to evolve. Along with expansion in the absolute number of geospatial workers employed in the public and private sectors is greater diversity in the fields where their work has become important. Together, these trends generate demand for new types of educational and professional development programs and opportunities. Colleges and universities have responded by offering structured academic programs ranging from minors and academic certificates to full GIS&T degrees. Recent efforts also target experienced GIS&T professionals through technical certifications involving software applications and more comprehensive professional certifications designed to recognize knowledge, experience, and expertise. Wikle, T. (2018). GIS&T Positions and Qualifications. The Geographic Information Science & Technology Body of Knowledge (2nd Quarter 2018 Edition), John P. Wilson (ed.). DOI:10.22224/gistbok/2018.2.9. This entry was published on June 29, 2018. This Topic is also available in the following editions: DiBiase, D., DeMers, M., Johnson, A., Kemp, K., Luck, A. T., Plewe, B., and Wentz, E. (2006). GIS&T Positions and Qualifications. The Geographic Information Science & Technology Body of Knowledge. Washington, DC: Association of American Geographers. (2nd Quarter 2016, first digital). academic certificate: Academic certificates are awarded by colleges and universities to degree and non-degree seeking students who complete a prescribed set of courses. Like degrees, certificate programs are overseen by faculty and must be approved through an institutional process. professional certification: Professional certification is a voluntary process that recognizes individuals who provide documentation of professional competency and can demonstrate mastery of a body of knowledge. Whereas academic certificates and degrees prepare entry-level GIS&T workers, applicants for professional certification are typically mid-career professionals. technical certification: Technical certifications can be earned by individuals who pass an examination demonstrating competency in the use of a GIS&T application such as Esri’s ArcGIS. accreditation: Program accreditation is an institutional designation granted to academic units that achieve standards involving faculty qualifications, facilities, curricula, and other factors. Accreditation has yet to be widely implemented within institutions that offer GIS&T certificates or degrees. Geographic Information Science and Technology (GIS&T) made its higher education debut more than 40 years ago. Since that time, the availability of spatial data and advances in hardware, software, and data connectivity have elevated GIS&T into a multi-billion dollar industry. Responding to the need for college graduates who can utilize GIS&T for problem solving, colleges and universities have created thousands of new GIS&T courses using formats ranging from traditional face-to-face class lecture and laboratory meetings to Internet-based modules and massive open online courses (MOOCs). More comprehensive programs have also been developed including academic certificates, undergraduate minors, and full degree programs in GIS&T. In recent years professional organizations have played a greater role in guiding the design and implementation of academic GIS programs. For example, in 2012 the Urban and Regional Information System Association (URISA) developed the Geospatial Management Competency Model (GMCM) for the U.S. Department of Labor Employment and Training Administration as a means of assisting educators in creating curricula that address workforce needs. GMCM outlines 74 essential competencies and 18 competency areas that represent the work of managers in the geospatial industry. In addition to helping match GIS instruction to learning outcomes, the matrix is intended to guide the development of professional certification and accreditation programs. The growing popularity of academic GIS&T certificate programs reflects recognition of the importance of GIS&T within a broad diversity of fields. Academic certificates are earned by completing a prescribed set of courses designed to establish a foundation of GIS&T principles and problem-solving skills. Certificates can be completed as independent academic credentials but most are earned concurrently with a degree in a field such as engineering, wildlife, planning, or geography. While most are general, some certificates offer possibilities for specializing in an applications area such as natural resources management or planning. Coursework necessary to earn an academic certificate varies considerably across institutions with a national average of about 15 semester credit hours (Wikle 2010). While the majority of GIS&T certificates are offered through traditional face-to-face instruction, an increasing number can be pursued online. At some institutions a separate certificate may be available for graduate students. Compared to academic certificates, the roll-out of full degree programs in GIS&T has taken place more slowly. 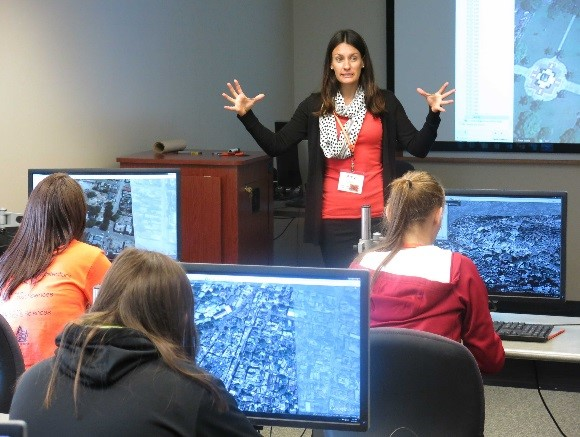 GIS&T degree programs prepare students for work as full-time geospatial professionals in business, government, and not-for-profit organizations. Most GIS&T degree programs require students to complete prerequisite coursework in science and mathematics subjects (Wikle and Finchum 2003). Depending on the unit offering the degree, students also take courses in related areas such as computer science, surveying, engineering, geography, and statistics (Figure 1). At some institutions a GIS&T minor may be available for undergraduate students. A recent trend is the growth of the professional masters degrees in GIS (the MGIS). A significant number of MGIS programs can be completed in one year and many are offered online (Lukinbeal and Monk 2015). Figure 1. Geography professor Amy Frazier explaining the use of digital orthophotos. Source: Image provided by author. Recognizing the importance of encouraging quality and standards of ethical behavior among persons already employed as GIS&T professionals, a few professional organizations have developed programs that recognize mid-career GIS&T professionals who have achieved explicit standards involving knowledge, educational attainment, work experience, and professional engagement. Professional certification in GIS&T recognizes high standards of knowledge, competency, and ethical conduct (Mathews and Wikle 2017). Given similar names, professional certifications are sometimes confused with academic certificate programs administered by colleges and universities and technical certification programs sponsored by software vendors. As a means of encouraging ongoing professional development and engagement, certified GIS&T professionals must complete a recertification process on a regular basis, generally every five years. Two professional certification programs are available in the U.S. Modeled after its longstanding programs for recognizing surveyors and photogrammetrists, the American Society for Photogrammetry and Remote Sensing (ASPRS) developed the first GIS&T certification program in 1991. Certified Mapping Scientist, GIS/LIS applicants must submit a detailed portfolio documenting educational attainment, professional experience, and other evidence of competency. Along with submitting a portfolio of materials for review, applicants are required to achieve a passing score on an examination designed to assess mastery of a body of knowledge. A second GIS&T certification program developed by the GIS Certification Institute (GISCI) was established in the early 2000s. Like the ASPRS’s program, applicants to become Geographic Information System Professionals (GISPs) must submit a portfolio and pass a knowledge test. The GISP is presently the world’s largest GIS&T certification program with nearly 9,000 awarded since 2003 (Mathews and Wikle 2017). Outside the U.S., certification programs have been implemented in Canada (Geomatics Specialist, GIS/LIS) and Australia/New Zealand (Geographic Information Systems Professional-Asia Pacific) (Wikle 2015). The Standard Occupational Classification (SOC) System is used by federal agencies such as the U.S. Department of Labor’s Bureau of Labor Statistics (BLS) and U.S. Office of Personnel Management (OPM) to classify workers having similar responsibilities and educational or training requirements. SOCs define jobs within 23 major occupational groups, 97 minor groups, and 461 broad occupations. GIS&T positions such as GIS Technician, GIS Analyst, GIS Specialist, and GIS Director/Manager fall within the broad SOC Category 15, Computer and Mathematical Occupations (Table 1). This occupational group also includes Computer System Analysts, Computer Programmers, Network Administrators, Actuaries, and Statisticians. Another group of GIS&T positions fall under SOC Category 17, Architecture and Engineering Occupations, including Photogrammetrists, Cartographers, Mapping Technicians, and Mapping Editors. A few others are within SOC Category 19, Life, Physical and Social Science Occupations, including Remote Sensing Analysts and Remote Sensing Scientists. Some private organizations and government agencies have created “career ladders” enabling employees to move into more advanced position levels (i.e. GIS Analyst I to Analyst II or Specialist I to Specialist II). For example, California’s Los Angeles County classifies GIS&T workers using a five step process within each of eight titles (Los Angeles County 2018). An advantage of career ladders is that individuals can be promoted without having to leave an organization. Formal job titles are important within government agencies and large private organizations for maintaining consistency in the classification of employees. For example, position titles are necessary for defining reporting structures, assigning duties and responsibilities, and determining appropriate financial compensation. In the early years of GIS implementation, GIS&T professionals were sometimes assigned titles poorly matched with their responsibilities such as “engineer” or “drafting technician” (Wikle 2010). Fortunately, an increasing number of organizations recognize unique knowledge and expertise needed by persons who work with geospatial data. Today, many organizations use position titles that closely follow model titles endorsed by the Urban and Regional Information Systems Association in 2000: GIS Technician, GIS Analyst, GIS Specialist, GIS Programmer/Developer, and GIS Coordinator/Manager. Regardless of type or level, most employers prefer hiring GIS&T professionals with a degree in GIS&T or a closely related field such as engineering, geography, planning, or computer science. Enrolling in a sequence of GIS&T courses, completing an academic GIS&T certificate, or participating in a technical certification is viewed favorably in hiring decisions (Wikle 2010). In addition, job advertisements may stipulate expertise with specific GIS&T software applications. Finally, skill in using database management systems and programming languages are highly valued. GIS Technician is a common entry-level position within many organizations that employ geospatial workers. Most technicians are involved in the construction and maintenance of spatial and non-spatial databases and some may be responsible for data capture or other input tasks. Technicians may also be involved in data conversion and/or quality control and in the preparation of maps, figures, tables, and other information. Along with a basic understanding of database management and GIS&T software, persons intending to apply for technician positions may benefit through familiarity with Global Positioning System (GPS) equipment and related technologies. As entry-level employees, technicians aren’t expected to have extensive work experience. Most positions require an associates or bachelor’s degree in GIS&T, computer science, engineering, forestry, environmental science, planning, or a related field. Within the coming years the employment outlook for GIS&T technicians is predicted to be strong. Anticipated growth for GIS&T technicians is expected to be 11% between 2016 and 2026 (BLS 2017). The titles “analyst” and “specialist” have been used interchangeably within computer-related fields since the 1970s (Nunamaker, Couger and Davis 1982). The creation of many new GIS&T analyst and specialist positions in the late 1990s resulted in efforts to better define the meaning and responsibilities of each position. According to Huxhold (2000), GIS analysts focus on data analysis, data conversion, and the coordination of efforts to capture spatial data. In contrast, specialists concentrate on problem-solving and the discipline-specific needs of GIS&T end-users. Both analysts and specialists are expected to have a strong foundation in spatial analysis and be well-versed in utilizing GIS and database management software. In some cases, analysts and specialists may be expected to have expertise involving relational databases and query languages, such as Structured Query Language (SQL). Cartographic skills are also important and, depending on their employer’s mission, expertise involving online and mobile mapping systems used by the public. Within larger organizations, analysts and specialists may also be responsible for training and supervising technicians. Strong communication skills are important to both types of positions (Wikle and Fagin 2015; Hong 2016). The minimum educational requirement for most analyst and specialist positions is a bachelor’s degree in GIS&T, geography, or a related field. Some employers may show a preference for applicants having an academic GIS&T certificate or advanced degree in GIS&T or a related field. Employment prospects for analysts and specialists remains fair to good with projections indicating modest (3%) growth between 2014 and 2024 (ONET 2017). GIS coordinators and managers are typically seasoned GIS&T professionals who serve as project managers, IT supervisors, and administrators. Most are responsible for hiring, training, supervising, and evaluating employees within their unit. As team leaders, coordinators and managers may also be involved in writing proposals, navigating regulatory issues and processes, ensuring quality control, developing schedules, monitoring productivity, and other administrative or managerial tasks. Within larger organizations, coordinators and managers may use the title Information Technology (IT) Director or Geographic Information Officer (Dempsey 2017). The educational and work experience requirements for coordinators and managers varies considerably. Some began utilizing GIS before the availability of academic GIS&T programs or other formal training. Most supervisory positions require a bachelors or masters degree and a minimum number of years as a GIS&T professional. Along with GIS expertise, a strong background in information technology and business is important. Increasingly, learning opportunities and activities outside of traditional classroom instruction are valued by organizations that employ GIS&T professionals. For example, internships create opportunities to gain work experience while enrolled in an undergraduate or graduate degree program. Internships are defined as learning experiences that take place within a professional setting under the supervision of a practitioner. The most effective internship experiences involve meaningful work assignments (as opposed to routine “grunt work”) with the intern serving as a project team member. Internships can be completed for academic credit or arranged independently of degree requirements and can be established to involve compensation or be completed as a volunteer experience. As noted by Craig and Wikle (2016), successful GIS&T internships must involve clear communication about expectations and objectives. A formal “learning contract” among the intern, employer, and supervising educator can be useful in defining the work assignment and how it relates to desired learning outcomes. Along with serving as a bridge between academic and work environments, an internship may become a pathway to full-time employment. As GIS&T software applications become more powerful and complex, vendors have begun offering specialized technical certifications. Technical certifications are awarded in recognition of completing a short course (or series of online modules) along with a passing score on an examination. Examples include Esri’s technical certifications in Web Application Developer and Enterprise Geodata Management. Others are Oracle’s Database Certified Professional and Microsoft’s Windows Server. Although yet to be widely implemented, accreditation offers possibilities for improving academic GIS&T programs through a formal process of evaluation using standards tied to faculty qualifications, facilities, curricula, and other measures (Wikle 2018). In lieu of being managed through higher education, program accreditation operates as a peer review process involving educators and practitioners who work together during a site visit and subsequently, in the preparation of a report and recommendation. Many fields such as engineering and medicine have implemented program accreditation as a means of assessing academic units on factors that look closely at the content and organization of degree programs. The accreditation process may also consider how students are advised and monitored and the extent to which educational objectives are evaluated and assessed. Along with providing an incentive for strengthening programs, accreditation may eventually serve as a symbol of quality useful to GIS&T students in comparing programs. Huxhold, W. (2000). Model Job Descriptions for GIS Professionals. Park Ridge, IL: URISA. Wikle, T. (2015). A Look at GIS Certification Programs and their Challenges for Higher Education. URISA Journal, 27(1), 5-10. Discuss the role of academic programs in GIS&T including certificates and degree programs. Identify standard occupational codes that are relevant to GIS&T. Identify types of GIS&T positions and their qualifications and explain why it has been difficult for many agencies and organizations to define positions and roles for GIS&T professionals. Describe the role of internships, professional certification, software certifications, and accreditation in relation to GIS&T positions and qualifications. Explain the differences among academic certificates, professional certification, and technical certification. In what ways is work performed by GIS analysts different from that of GIS technicians? What are benefits of career ladders? Describe benefits associated with completing a GIS&T internship.